Do you know others who could benefit from access to this training? You can do this via the share bar to the left – Facebook, Twitter, Google +, and more. Please feel free to add any content on this page to your website or blog, in your emails, and on social media. If you need more content for specific purposes, just let us know and we can provide it readily. Learn essential cycling skills and laws – online! Valuable for experienced cyclists, as well as beginners. "Do I have to ride at the edge of the road, or can I control my lane?" "How can I encourage drivers to give me enough space, and cooperate with me?” "What laws apply to me as a cyclist?" In this course, you’ll find the answers. This includes over 4 hours of interactive content that you can access on your own schedule — all at once or a bit at a time. Learn proven techniques to increase your comfort and competence in traffic. Explore your rights and responsibilities. 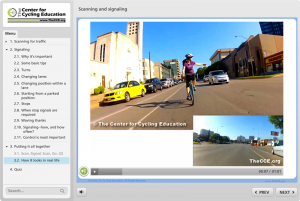 Bike handling skills: Including scanning, signaling, ‘cadence’ and shifting. Being an MVP-C: Maneuverable, Visible, Predictable and Communicative. Our legal rights and responsibilities: How following the law works in our favor. Scanning and signaling: Putting them into practice. Choosing a place on the road: Selecting the proper lane and lane position, avoiding parked cars, managing bike lanes. Managing intersections (including 4-way stops): Lane position, stopping, right of way, making turns and more. The price is only $35 US for 6 months of access, and a 30-day money-back guarantee is offered. It just takes a minute to sign up, and you can start whenever you like. Visit thecce.org/online-courses for more details and to get access. These courses are developed by The Center for Cycling Education. Separate courses are available for the USA and Canada. A Defensive Cycling (ticket dismissal) program is available and can be readily implemented in your municipality.